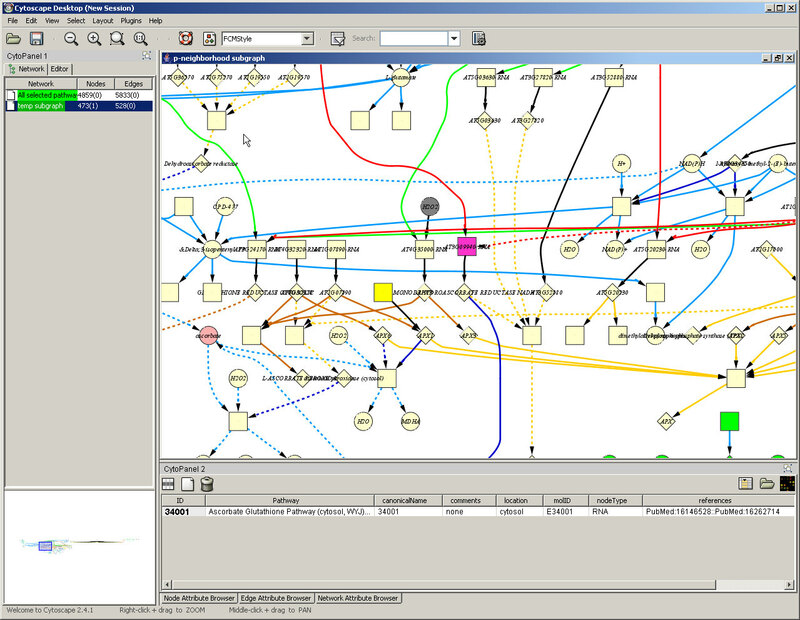 The MetNet Plug-ins for Cytoscape are a set of Java open-source programs for visualizing and analyzing biological networks. The goal is to capture the intuitions of biologists and provide a modeling framework to assess large amounts of data. Use graph theoretic approaches to analyze network structure and behavior and search for critical paths in the network. Visualize the results of experiments for different types of omics data and allow translation between platforms. Integrate genetic network inference and metabolic pathway analysis algorithms developed in R statistical language. The resulting sub-networks can be identified and interpreted using simple fuzzy cognitive maps. Data from high-throughput experiments (transcriptomics, proteomics and metabolomics) can be displayed and modeled in the context of the network graphs. Subgraph Creator: functions to create subgraphs, identify node, find cycles, find paths and find p-neighborhoods in a large graph file for dynamic graph display. Dot layout: allows the use layouts from the Graphviz program, examples include simple and rank-cluster layout. Cycle and path finding algorithms in directed and undirected networks. OmicsViz: Visualize 'omics data in the graph and Microarray platform translation. Works for Cytoscape versions 2.3 and later. 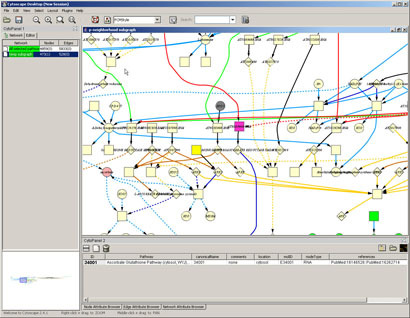 The plug-ins are designed to visualize networks from the MetNetDB. These files are accessible using the XMLBuilder tool. We are also working to import data files in SBML and from the BioCyc project for more pathway information.